Rombalds Stride - a long trip around Ilkley Moor. Long Mynd Valleys - a running of next month's Championship course, in its traditional time slot. Results. A notable win for Tom Saville, both in the race and in the family contest, especially with a strong field, prospecting for the Championship event. Equally notable is first LV50 for Tracy Greenway. Kong Mini MM - Round 1 - from Borrowdale - results. 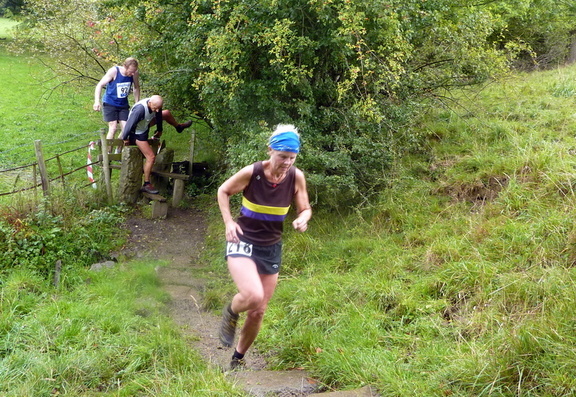 Kirsty and Helen giving a very strong 8th place overall. Mickleden Straddle - very muddy and sloshy, but quite benign really. No wind, no ice, no snow, and not that cold. Very boggy coming back up from the dams, all now a sinkable path, where once it was a compass job. Results. A most welcome precise kit check, and the renowned, excellent cakes, soup and sandwiches.